We had provided the BSNL Management Trainee Previous Papers for the given vacancies, which will help the candidates at the time of preparation. By practicing the more Bharat Sanchar Nigam Limited (BSNL) Sample Papers, applicants can easily improve their solving and logical skills. So, every applied aspirant must and should have to download the last five years bsnl.co.in Management Trainee (Telecom Operations) Previous Year Question Papers from this article. Through this article, applicants can get more information about the Bharat Sanchar Nigam Limited Selection Process, and bsnl.co.in Exam Pattern 2019. Form the below table, candidates can get the information of organization name, the name of the posts, number of vacancies available in the Bharat Sanchar Nigam Limited organization, starting and ending date of an application process. And also they can get data such as category, date of examination, selection process, job location, and official site also. Our team of Sarkari Recruitment had gathered all the details from the official site of the Bharat Sanchar Nigam Limited (BSNL) and had provided them in the tabular form as below table. In the below table, applicants can get the bsnl.co.in Management Trainee (Telecom Operations) Exam Pattern 2019. And they can also get the complete idea on bsnl.co.in Management Trainee (Telecom Operations) Exam Pattern 2019, before going to download the BSNL Management Trainee Previous Papers. Furthermore, the below table comprises the names of the subjects, the time duration of the exam and the number of questions available in the exam paper. And also get the weightage for each section. Candidate scan bookmark our site by clicking the Ctrl+D and also they can share this information with their friends also. Time duration is 3 Hours 10.00 A.M. to 1.00 P.M. The higher authorities of Bharat Sanchar Nigam Limited (BSNL) had assigned the Selection Process For BSNL Management Trainee Vacancies 2019. Every candidate who had applied, they must and should have to attend for the Management Trainee (Telecom Operations) selection process which was given by the board members of Bharat Sanchar Nigam Limited (BSNL). From the below links, candidates have to download the BSNL Management Trainee Previous Papers. Contestants who had qualified in the Management Trainee (Telecom Operations) written exam, they only will have a chance to participate in the further rounds of the selection process that is Document verification, Group Discussion, and Interview. Download the BSNL Management Trainee Previous Papers, so that aspirants can increase their speed level of answering the problems given in the test paper. Besides, competitors will have a chance to get equal questions in the Management Trainee (Telecom Operations) exam. So, we suggest all the aspirants, to collect the BSNL Management Trainee Previous Papers, and start their preparation as early as possible. 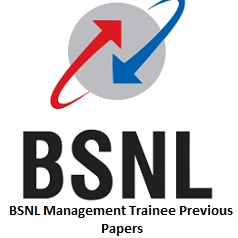 Don’t forget to download the BSNL Management Trainee Previous Papers in PDf format for free of cost from the above links according to subject wise. So, applicants have to follow our site Sarkarirecruitment.com website to know the latest updates related to the latest recruitment notifications of state and central government jobs, admit cards, results and the syllabus, the previous papers, interview lists and many more. If applicants have any questions they can leave us a comment in the below decision box. Thank you.